Get Your Google On! 17 Google Gurus and Hashtags to Follow! 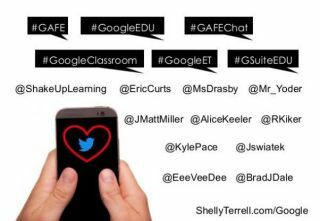 Recommended hashtags to follow on Twitter for Google tips and resources are #GoogleEDU, #GAFEChat, #GAFE, #GoogleClassroom, #GoogleET, and #GSuiteEdu. These are the Google gurus on Twitter I learn from most. I created a Twitter list for you to quickly follow them and check out their blogs! Google gurus- @EricCurts, @Mr_Yoder, @ShakeUpLearning, @MsDrasby, @KylePace, @RKiker, @Jswiatek, @BradJDale, @AliceKeeler, @JMattMiller, and @EeeVeeDee.